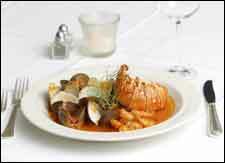 Seafood Saga is an event that took place on 19-Oct-2005 in Hyderabad. If you thought seafood was just fish and prawns (and you liked them), well, coming your way is an unexpected  feast with The Seafood Saga every Wednesday, at Taj Krishna's Encounters. i. e. ,   lobsters, prawns, oysters, calamari, squid, crabs and much more. For more details, please contact Encounters at 5566-2323.
fullhyd.com has 700,000+ monthly visits. Tell Hyderabad what you feel about Seafood Saga!